A neon sign is a lighting display made of glass tubes that have been filled with a gas and bent into the shape of letters or decorative designs. When a high-voltage electrical current is passed through the gas, the tubes emit light. Although neon gas was originally used in these signs, several other gases are also used. These gases, along with different tints and phosphor coatings for the glass tubes, produce a spectrum of over 50 brilliant colors. Neon signs can be as simple as a small advertising sign for beer, or as complex as a multi-story facade on a Las Vegas casino. Neon signs evolved from scientific experiments in which various gases were subjected to high-voltage currents. In 1856, Heinrich Geissler produced a light source by passing a high-voltage alternating current through a low-pressure gas sealed in a glass tube. Subsequent experiments showed that almost all gases would conduct an electric current, and that many would produce light. The problem was that most of the common gases, like carbon dioxide, would react with the current-carrying electrodes within the sealed tube. This quickly reduced the efficiency of the electrodes until the light sputtered and died. In 1898, Sir William Ramsay and Morris William Travers developed a method for the fractional distillation of liquid air. In the process, they discovered the rare gas elements neon, argon, krypton, and xenon. Using these gases in sealed glass tubes, they produced colored light sources ranging from a bright reddish-orange for neon to an intense grayish-blue or violet for argon. Not only did these gases produce colored light, but they were chemically inert and did not react with the electrodes. Fractional distillation of liquid air remained an expensive process until 1907 when Georges Claude of France and Karl von Linde of Germany developed a more economical method. Georges Claude's original interest was to produce quantities of oxygen for use in hospitals and industries. The rare gases that were also produced by this distillation process had no ready market, which prompted Claude to seek potential applications. Utilizing the previous experimental work of Ramsay and Travers, he began promoting illuminated signs using tubes filled with neon gas. He displayed his first neon sign at an exposition in Paris in 1910, and made his first commercial installation in 1912. By 1915, business was so promising that he formed the Claude Neon sign company and began selling franchises. Neon signs came to the United States in 1923 when a Los Angeles car dealer, Earle C. Anthony, bought two of Claude's signs for his Packard dealership. Throughout the 1920s and 1930s, neon tubes were used for signage as well as decorative displays, and they became an integral part of the architecture of many buildings. By 1947, several casinos in Las Vegas began to draw attention with their elaborate neon lights. monthly tours of notable examples of neon displays throughout the city. Although neon gas was originally used in neon signs, it is now only used to produce reds and oranges. Argon, or an argon-neon mixture, is used in most signs. To improve the intensity of the light, a small amount of mercury is added to the argon to produce an intense blue light. This light impinges a variety of light-emitting phosphorescent materials coated on the inside of the glass tube to produce various colors. Optical tints in various colors may also be used, or the glass may be left clear if a strong blue light is desired. Xenon, krypton, and helium gases are sometimes used for special color effects. The glass tubing used in neon signs is made from soft lead glass that is easily bent and formed. It ranges from 0.3 inches (8 mm) to 1.0 inches (25 mm) in diameter and comes in lengths of 4-5 feet (1.2-1.5 m). The electrodes in each end of a section of illuminated tubing are usually made from very pure iron surrounded by a cylindrical glass jacket or envelope with one end open. 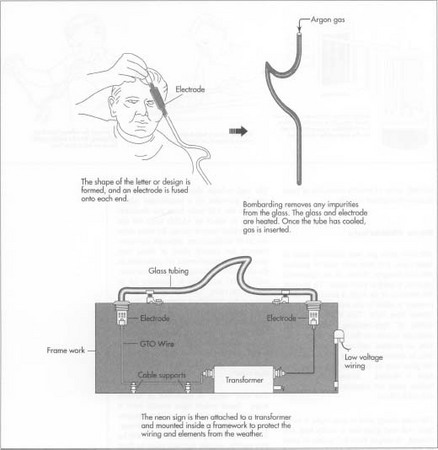 A wire is attached to the metal electrode and passes through the closed end of the glass envelope. The closed end is sealed into the end of the sign tubing with the open end protruding into the tube. The high-voltage electricity to power the sign is provided by a transformer which converts the 120 volts from the electrical lines to as much as 15,000 volts for the sign. Typical current ratings for neon signs are 30-60 milliamperes, although the transformers are usually sized at twice that amount. The transformers are connected to the electrodes in the sign using special wire, called GTO wire, that is insulated for at least 7,500 volts. This wire is also used to connect the individual sections of illuminated tubing in series. The wire is connected to the transformer through an insulated housing made of borosilicate glass with a spring connection on one end. The transformer and wires are purchased from a separate manufacturer and installed by the sign maker. The sign tubing is supported in several ways. Small indoor signs usually have a thin steel skeleton framework that supports both the tubing and the power transformer. The framework is painted black so it will be less visible, making the sign seem to float in space. Large outdoor signs may be supported by wood, steel, or aluminum structures. The glass tubing is held by glass supports with metal bases. The transformer is placed inside a cabinet to protect it from the weather. few exceptions each sign is unique and must be designed to fit the desired display within the confines of the available space. Considerations of the diameter of the tubing, the minimum radius the tubing can be bent, and the overall length of tubing the transformer can power all limit the final design. For example the smaller the diameter of the tubing, the brighter the light. Conversely a smaller diameter tubing requires more power, thus limiting the over-all length of tubing one transformer can handle. Manufacturing neon signs is largely a manual process. It consists of bending the tubing and attaching the electrodes, removing any impurities from within the tubing, then evacuating the air and adding the gas. The following process is typical. 1 Lengths of glass tubing are cleaned and placed vertically in a coating machine. The machine blows a liquid phosphor suspension upwards into the tube and then lets it drain back out the bottom. The tubes are placed vertically in an oven which dries the coating. Color tints are applied in a similar manner. Tubes that are to be filled with neon to form a red or orange light or argon to form a blue light are left clear. 2 The design of the sign is laid out in full size on a heat-resistant sheet of asbestos. The glass tubing is carefully heated and softened using a variety of burners. Gas-fired ribbon burners 24 inches (61 cm) or longer are used to make curves in round letters and the sweeping curves of script. Smaller hand torches are used to heat shorter lengths. Using the asbestos template as a guide, the tubing is bent by hand. The tube benders do not wear protective gloves because they must be able to feel the heat transfer and the degree of softening in the glass to determine the right moment to make the bend. To prevent the softened tubing from collapsing, the tube bender attaches a short length of flexible hose, called a blow hose, to one end. While the glass is still soft, the tube bender gently blows into the hose to force the tubing back to its original diameter. Tubes with restricted diameters will not operate properly. 3 Most large neon signs are made of several sections of glass tubing. A length of 8-10 feet (2.4-3.1 m) for each section is considered a practical limit. To make each section, the ends of two lengths of tubing are heated and spliced together. When the shape of the lettering or design has been formed for a section, an electrode is heated and fused onto each end. A small port, called a tubulation, is added to allow the tubing to be evacuated with a vacuum pump. This tubulation port may be part of one of the electrodes or may be a separate piece joined into the tubing. 4 A process known as bombarding is used to remove any impurities from the glass, phosphors, and electrodes. First the air inside the tubing is evacuated. After the vacuum reaches a certain level, dry air is allowed back into the tubing until the pressure is in the range of 0.02-0.04 inches (0.5-1.0 mm) of mercury. The longer the tubing, the lower the pressure may have to be. A very high-current transformer is connected to the electrodes. For a length of tubing that may normally run on 30 milliamperes, 400-750 milliamperes may used for the bombarding process. The high current heats the glass to about 420°F (216°C), and the metal electrode is heated to about 1400°F (760°C). This heating forces the impurities out of the materials, and the vacuum pump carries the impurities out of the system. 5 Once the tube has cooled, the gas is inserted under low pressure. The gas must be free from impurities in order for the sign to operate properly and have a long life. The normal fill pressure for a tube 0.6 inches (15 mm) in diameter is about 0.5 inches (12 mm) of mercury. The tubulation port is then heated and sealed off. 6 The finished gas-filled tubing is put through an aging process. Sometimes this process is referred to as "burning in the tube." The purpose is to allow the gas in the tube to stabilize and operate properly. A transformer, often rated slightly higher than the normal operating current, is attached to the electrodes. The tube should come to full illumination within 15 minutes if neon is used. It may take up to a few hours for argon. If a small amount of mercury is to be added to an argon tube, a droplet was first placed into the tubulation port before it was sealed. The droplet is then rolled from one end to the other to coat the electrodes after the aging process. Any problems such as a flicker in the gas or a hot spot on the tube indicate the tubing must be opened and the bombarding and filling processes repeated. 7 Small neon signs are mounted on their framework and wired in the shop. Larger signs may be mounted in pieces and put into place on the building or other support structure where they are interconnected and wired. Very large installations may require months to install. Pure materials and careful manufacturing processes are required in order to produce a properly operating neon sign. A well-built neon sign should have a life of over 30,000 hours. As a comparison, the average 100-watt light bulb has a rated life of 750-1,000 hours. Neon signs must meet the requirements of the Underwriters Laboratories to obtain a UL listing. This requires a series of tests by independent testing agencies. Neon signs must also meet the requirements of the National Electrical Code. Outdoor signs must comply with local building codes in their construction and electrical wiring. Recent developments in neon sign design include small, electronic transformers that make the audible hum of older neon signs a thing of the past. Neon signs that blink or appear to move are now controlled by programmable electronic controls that replaced the older electromechanical cam-and-switch controls. Neon displays have also found their way into consumer products such as telephones and automobile license plate frames. There are even neon displays that cover portions of the exterior of cars for the ultimate in a "flashy" vehicle. Neon signs are expected to continue to enjoy a resurgence of interest and applications. Some Japanese companies have expanded the palette of neon lights far beyond the 50 or so colors now commonly used. Neon displays that appear to move are also getting more complex and flamboyant with the aid of computer controls. Stern, Rudi. Let There Be Neon. Harry N. Abrams, Inc., 1979. Gromer, Cliff. "Neon Cowboy: Computer Magic Makes Vegas Lights Come to Life." Popular Mechanics, September 1994, pp. 56-57. Resnick, Rosalind. "Hot Lights on Wheels." Nation's Business, June 1994, pp. 14-15. Woods, Wilton. "Neon Comes Home." Fortune, March 20, 1995, p. 22.